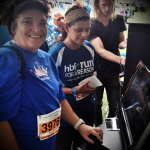 The fifth annual HBF Run for a Reason saw a record number of participants help raise more than $1 million for WA Charities. 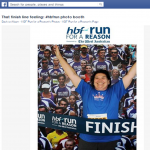 With the growth and popularity of sharing photos on Social Media the 2014 HBF Run for a Reason featured innovative Social Media Photo Booths to increase the engagement and awareness of the event. 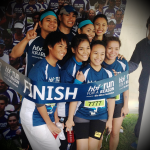 Groups of friends posed for photos in the Social Media Photo Booths at the Finish Line activation area. 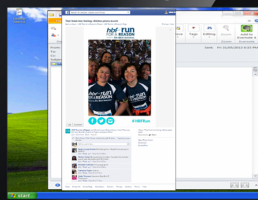 Using interactive touch screens they were able to share their race photo via Facebook, Email and Mobile. 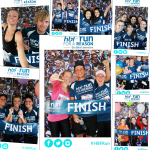 The Social Media Photo Booths were hugely popular giving participants the chance to share their moment completing the Run. 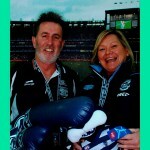 Participants were also given a free print out of their Photo to take home as a memento from the event. 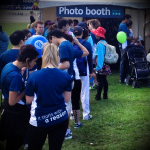 The Social Media Photo Booths helped generate instant (branded) Social Media content increasing the reach and engagement of the event. 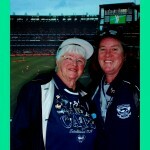 “Social media is about the here and now; events need to find ways to help participants instantly share content with friends on-line”. 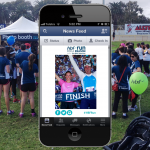 Interactive technology such as Social Media Photo Booths helps participants share and celebrate their achievements while increasing awareness for Events Organisers and Sponsors. 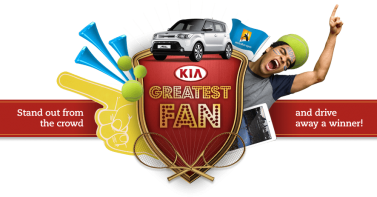 Fans able to instantly enter the Kia Greatest Fan competition inside the Social Shack at the Australia Open using BL!NK Republic interactive technology. 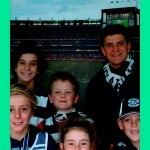 The Australia Open Social Shack has already attracted thousands of visitors, using the interactive technology to share their Australian Open experience, connecting via Social Media and entering the Kia Greatest Fan competition. 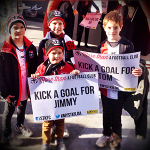 The interactive technology allows fans to get a photo recording their kicking speed. 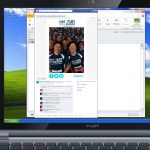 Fans can also use touch screens to instantly share their photo on Facebook or send a copy to an email or mobile. 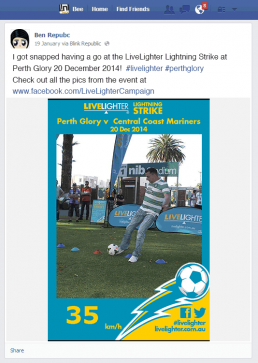 The activation attracted hundreds of fans increasing the reach, engagement and interaction of fans with the LiveLighter campaign. Perth’s Leederville Carnival features live performances across eight stages, market stalls, live performers, food and drinks attracting thousands of people to the streets of Leederville. 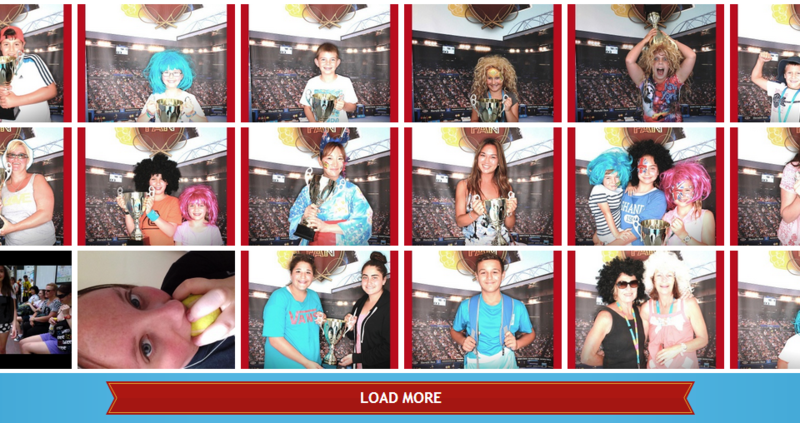 This year Carnival Partner Synergy used innovative Social Media Photo Booth technology to help share the fun of the Carnival with consumers at the event and on Social Media. 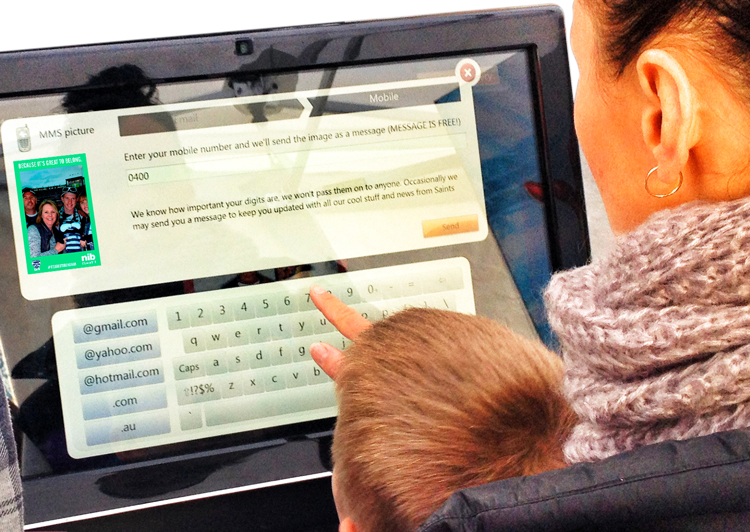 Hundreds of visitors participated in the interactive activation using the Booths touch screens to instantly share their photos via Facebook, email or mobile. 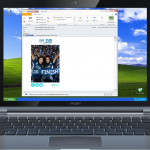 All the photos and messages included Synergy’s campaign message “Lets Use It Well” increasing the brands reach and engagement amongst consumers. 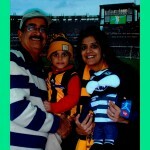 rediATM's Big Wednesday promotion gave away $100,000 to lucky consumers around Australia. 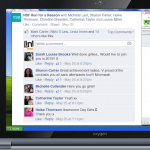 The campaign featured innovative Social Media Booth technology to instantly announce winners and share the fun on Social Media. 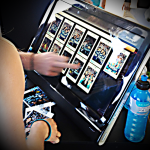 Consumer were able to instantly share their winning photos on Facebook, Twitter, email or mobile using the Social Media Booth generating a huge social buzz. 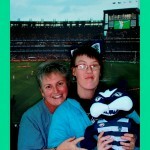 Here's just some of the thousands of people that participated! 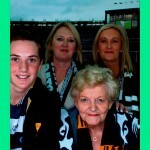 The NRL uses innovative Social Media technology to increase fan engagement on match day, increase Social Media connections and support the Alex McKinnon Foundation. The centrepiece of the NRL’s Rise For Alex round was the return of Alex McKinnon to Hunter Stadium for the Knights v Titans clash. 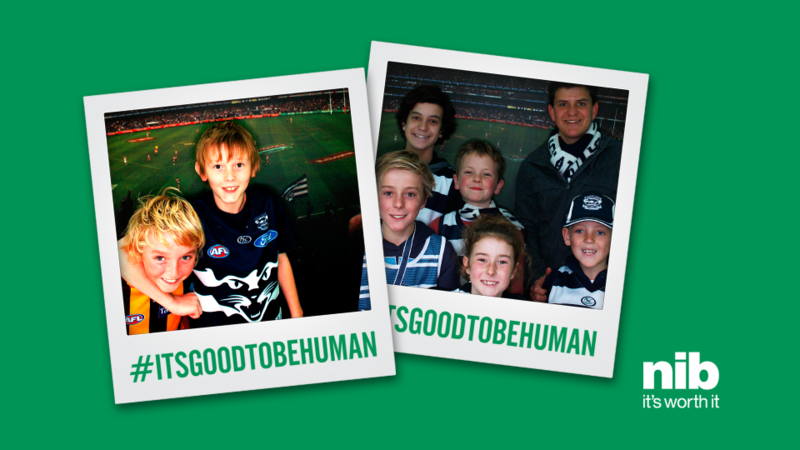 To help fans show their support for the #RiseForAlex campaign, increase Social Media engagement and add to the match day experience the NRL used a range of interactive technology including a Social Media Photo Booth and new INSTA-banner technology from Blink Republic. 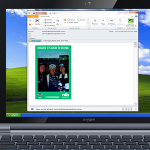 INSTA-banner technology instantly prints fans’ messages of support as 60cm x 40cm banners and allows them to instantly share their message on Social Media. 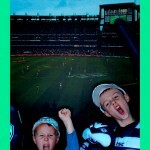 The INSTA-banner system has also featured at St Kilda AFL games and Australian Diamonds Netball games as part of Telstra sponsorship activations. 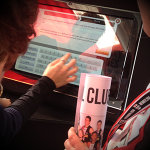 Hundreds of fans used interactive touch screens to instantly share their message of support on Social Media generating a huge Social Media buzz, increasing awareness and followers. 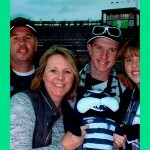 The NRL has previously used other interactive marketing technology to increase Fan engagement including Social Media Photo Booths to support the State of Origin Shield tour. 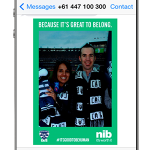 INSTA-banner is another example of innovative technology that helps adds to Fan's match day experience and increase on-line engagement. 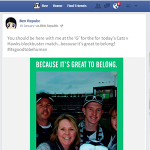 To help fans share the experience and take away a printed memento from the historic occasion Social Media Photo Booth technology from Blink Republic was used. 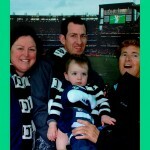 The interactive Social Media Photo Booth technology instantly prints branded photos for fans and lets them share their moment with the State of Origin Shield on Social Media, via email or mobile. 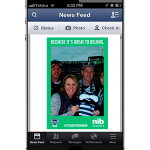 The Social Media Photo Booth was hugely popular with hundreds of NRL fans sharing their brand photos with Family and Friends generating a huge Social Media buzz for NIB. 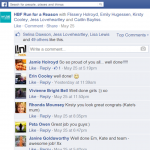 How Nike, Cricket Australia and HSBC increase Social Media Followers and Engagement with instant (branded) photo sharing using interactive Social Media Photo Booths. 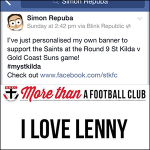 The St Kilda Football Club has used new INSTA-Banner™ technology from BL!NK Republic to help fans instantly share their personalised support messages for the Saints on Social Media and at the game. Check out the video here. 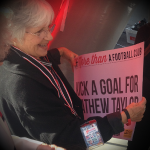 The interactive match day activation at Etihad Stadium included touch screens which enabled fans to instantly share their personalised messages of support for the Saints on Facebook, via email or mobile message. 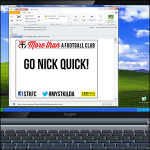 Fans also received full size (60cm x 40cm) support banners which printed in 30 seconds to show their support for the Saints at the game. 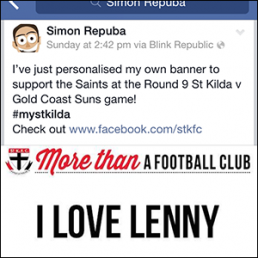 The St Kilda Football club already boast over 100,000 followers on Facebook with interactive Social Media activation like INSTA-Banner™ helping increase their reach and engagement. 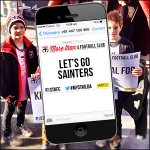 The INSTA-Banner™ posts shared by Fans on their Newsfeeds encourage Family and Friends to follow the Saints via links included in the posts. 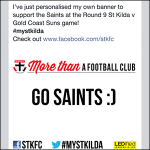 The instant Social sharing, email and mobile messages generated a huge Social buzz for the Saints and #mystkilda as the messages of support were Liked and Shared. 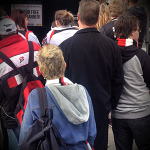 Fans loved their personalised St Kilda Football Club banners which included a 2014 team photo on the back to take home. 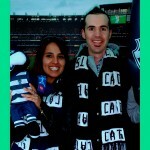 Sydney Start-up BL!NK Republic specialise in Interactive Marketing and Social Media Technology working with Brands and Rights Holders including Nike, Cricket Australia, Revlon, the NRL and McDonalds to increase engagement and interaction as part of Marketing Campaigns and Events.